^ "GDP per capita, PPP (current international $) | Data". data.worldbank.org. Retrieved 2019-01-19. ^ Janssen, Peter. "China train project runs roughshod over Laos". www.atimes.com. Retrieved 2019-01-19. ^ Marwick, Ben; Bouasisengpaseuth, Bounheung (2017). "History and Practice of Archaeology in Laos". In Habu, Junko; Lape, Peter; Olsen, John. Handbook of East and Southeast Asian Archaeology. Springer. ^ "Mekong Divides Different Worlds In 'Golden Triangle'". NPR.org. Retrieved 2019-02-01. ^ "Laos weighs medical use of marijuana". Xinhua. Retrieved April 10, 2019. ^ "Laos". Central Intelligance Agency: The World Factobook. February 17, 2019. Retrieved February 23, 2019. 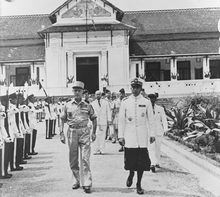 Prince Phetsarath Ratanavongsa was the 1st Prime Minister of Laos from 8 April to 20 October 1945, and was the first and last vice-king of the Kingdom of Laos. 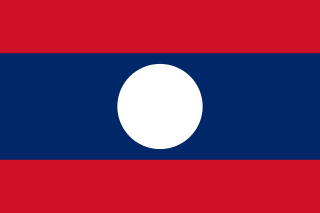 The flag of Laos consists of three horizontal stripes, with the middle stripe in blue being twice the height of the top and bottom red stripes. In the middle is a white disc, the diameter of the disc is ​4⁄5 the height of the blue stripe. The flag ratio is 2:3. The national flag of Laos was first adopted in 1945 under the short-lived Lao Issara government of 1945–46, then by the Pathet Lao. It is one of the two flags of a currently communist country that does not use any communist symbolism and the only current communist country that does not use a five-pointed star in its flag as an emblem. The current flag was adopted on December 2, 1975 when it became a socialist state. The situation of human rights in Laos has often been, and remains, a recognized cause for serious concern. Laos is one a handful of Marxist-Leninist governments and is ruled by a one-party communist government backed by the Lao People's Army in alliance with the Vietnam People's Army and Socialist Republic of Vietnam in Hanoi. Laos has an area of 85,000 square miles (220,000 km2) and contains a population of approximately 6.6 million. Almost all ethnic or "lowland" Lao are followers of Theravada Buddhism; however, they constitute only 40-50% of the population. The remainder of the population belongs to at least 48 distinct ethnic minority groups. 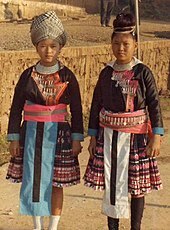 Most of these ethnic groups (30%) are practitioners of Laotian folk religion, with beliefs that vary greatly among groups. 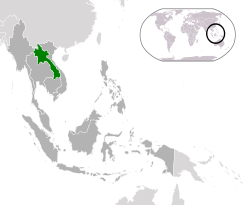 Laos – United States relations officially began when the United States opened a legation in Laos in 1950, when Laos was a semi-autonomous state within French Indochina. 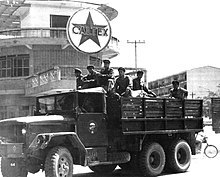 These relations were maintained after Lao independence in October 1953. 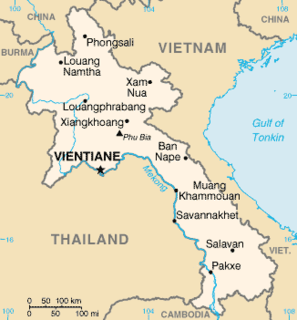 Vientiane Province is a province of Laos, located in the northwest of the country. As of 2015 the province had a total population of 419,090 people. Vientiane Province is a large province, covering an area of 15,927 square kilometres (6,149 sq mi) with 10 districts in mid north-western Laos. 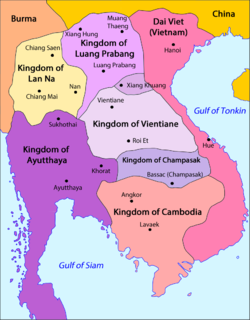 The province borders Luang Prabang Province to the north, Xiangkhouang Province to the northeast, Bolikhamxai Province to the east, Vientiane Prefecture and Thailand to the south, and Xaignabouli Province to the west. The principal towns are Vang Vieng and Muang Phôn-Hông. Several kilometres to the south of Vang Vieng is one of Laos's largest lakes, Nam Ngum. Much of this area, particularly the forests of the southern part, are under the Phou Khao Khouay National Bio-Diversity Conservation Area. 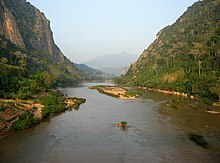 The principal rivers flowing through the province are the Nam Song River, Nam Ngum River and the Nam Lik River.